One of the biggest threats to your safety on the road has nothing to do with the inaccuracies of other drivers. Your safety is directly affected when you have damaged auto glass and you do nothing to restore it. Continuing to drive with glass damage obstructs your vision and can lead to an accident. PG Panorama City auto glass repair offers mobile response service that is designed to fit into your budget. Not every need for glass repair will happen during the morning commute. It is very common for damage to happen after work or during evening hours due to storm damage or vandalism. Staying where you are in an immobilized automobile is easier said than done. PG specialists for auto glass repair in Panorama City arrive quickly to inspect and repair any damage to your automobile windows while keeping your safety in mind. Severe damage to your automobile windows cannot be repaired using standard tools and procedures. A total replacement must be made to ensure your vehicle meets safety requirements under the law. PG Panorama City auto glass repair experts provide a lifetime guarantee on every window replacement. Every replaced window will never leak or become defective due to mistakes or errors during technician installation. Residential vehicles and commercial vehicles need quality glass installed when windows are broken. Inexperienced companies may rely on cheap replacement glass, but PG auto glass repair in Panorama City relies solely on OE glass for every replacement. This is the only type of glass that is accepted by auto manufacturers as a certified replacement to the originally installed glass. 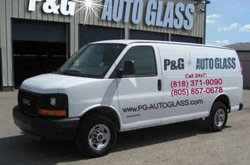 PG Auto Glass always keeps you safe with high quality replacements. Routinely inspecting your car or truck for glass damage reduces the chance of needing a total replacement. The smallest holes and cracks can quickly develop into a bigger problem that requires emergency Panorama City auto glass replacement service. Expert technicians arrive from PG Auto Glass using stocked mobile response trucks for the most trusted auto glass replacement in Panorama City. Do you need car window repair or replacement services in Panorama City, CA in zip codes 91402 or 91412? Contact PG Auto Glass to receive fast and reliable services.